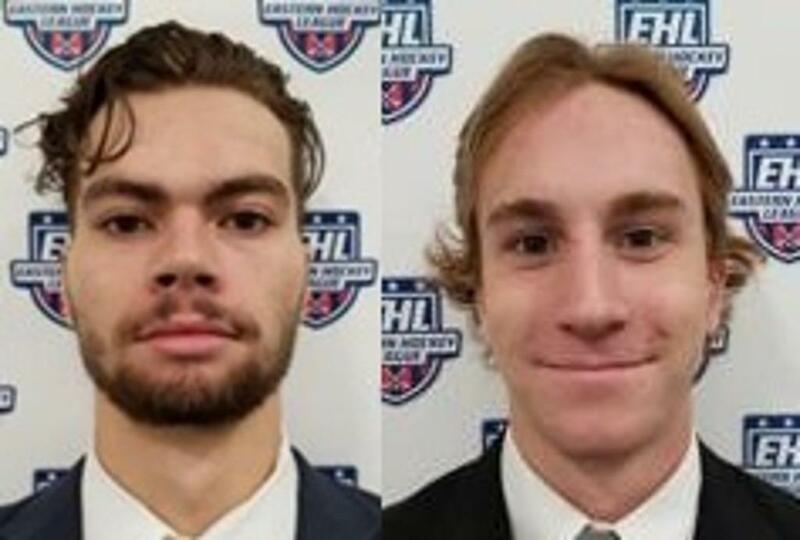 The Philadelphia Jr. Flyers EHL Junior team is pleased to announce its Players of the Week for week ending January 27, 2019. The winners are forward Justin Weinbrenner and defenseman Riley Dohner. Weinbrenner, an Allison Park, PA native, had six points (4 goals and 2 assists) in three games this past week. The 6’7”, 225 lb. forward has twenty-nine points (16 goals and 13 assists) in thirty-six league games so far. Dohner, a Hershey, PA native, had two points (1 goal and 1 assist) in three games. It was Dohner’s first goal on the season. The 5’9”, 150 lb. defenseman has eight points (1 goal and 7 assists) in thirty-three games played. “We played very well this past weekend” stated general manager and head coach Jerry Domish. “It was a team effort and I thought Justin and Riley played really well. I’m really happy for Riley for scoring his first goal on the season” concluded Domish.